I participated in quilt bees for the first time in 2015. For Stash Bee last July I chose the Simply Woven pattern from the Moda Bake Shop website, written by Jessica Kelly. I asked that blocks be made in a rainbow of color, using red, orange, yellow, green, blue and purple each once, in any placement within the block. I ended up with 13 blocks (12 shown above), and knew I'd need to make a bunch more (23!) to get to a 60" x 60" finish, my preferred minimum size for a lap quilt. So this project got set aside. Fast forward to last month. 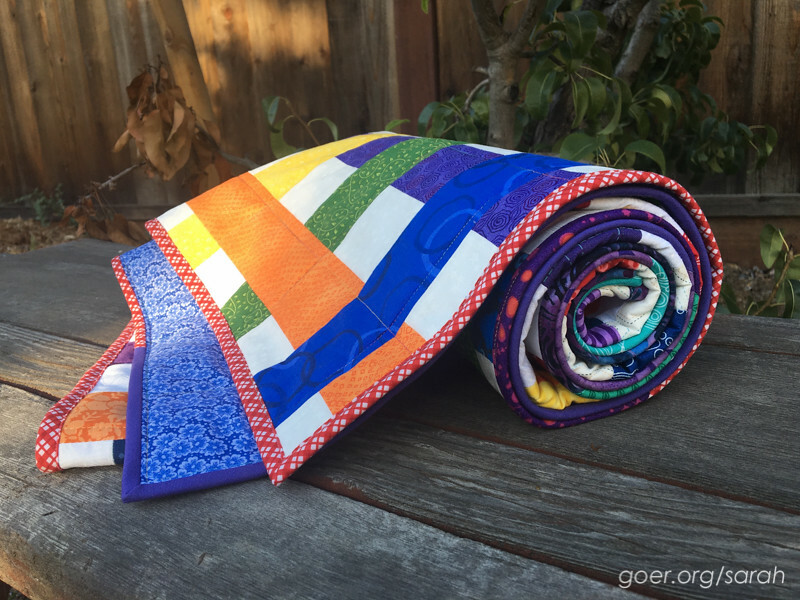 When the initial call from the Orlando Modern Quilt Guild came to help make quilts for the victims and families of victims of the shooting at Pulse (all details about the quilts here), I thought of the Woven Rainbow project. 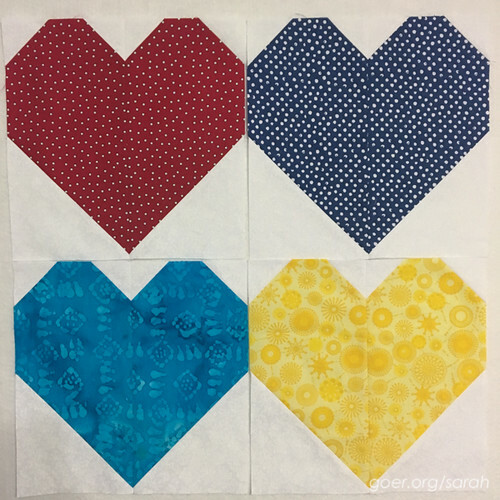 As details about the quilt plans unfolded, they asked for heart blocks. My local guild is combining efforts to finish a couple quilts to send, so I opted to make some blocks for our group to use. And my Woven Rainbow blocks stayed in their container. Just a day or two after that came the devastating news of the death of 2-year-old Lane Graves in the alligator attack at Walt Disney World. I thought a lot about the family and when I read that Lane had a 4-year-old sister, my heart broke for her especially. I have a 4-year-old daughter and I can't imagine her world being rocked by the loss of her sibling. I knew immediately that I wanted to make a quilt for Ella. 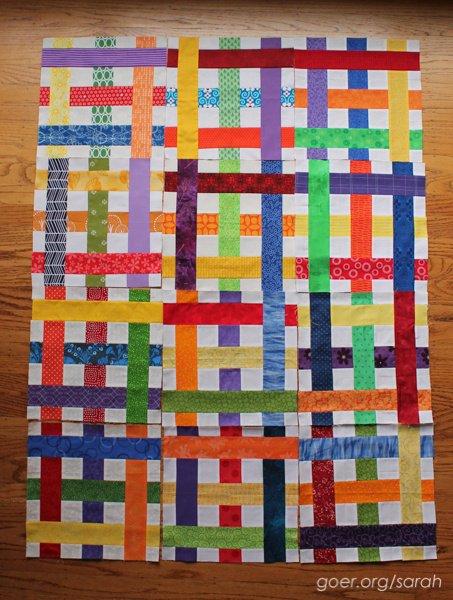 As you know, quilts take time, so I thought about what I had in progress that I could finish up especially for her. My Woven Rainbow project seemed like just the choice. 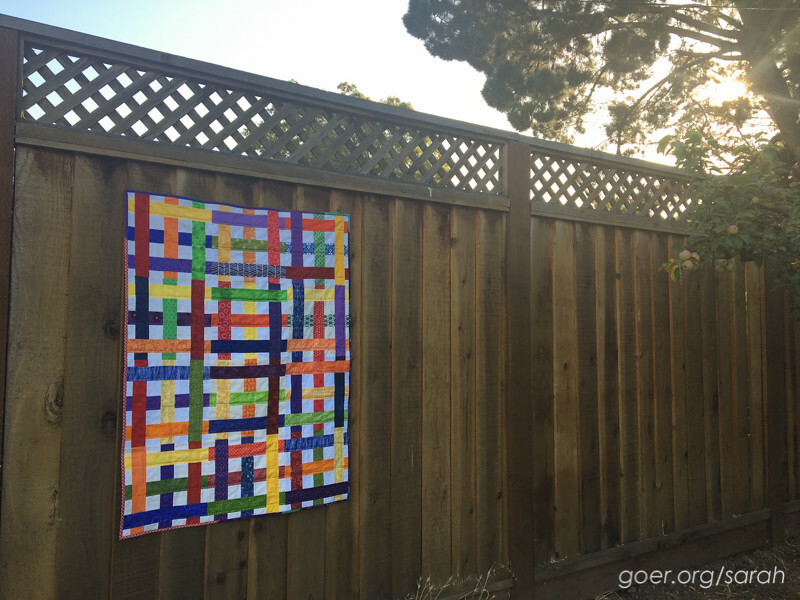 I could use 12 blocks to make a 36" x 48" quilt, a great size for a 4-year old. And the rainbow palette seemed just right as well. 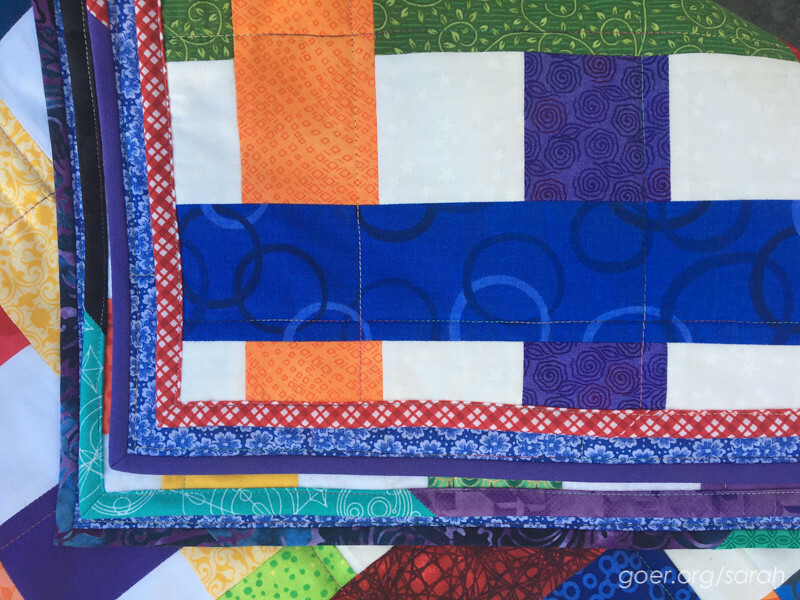 I chose a blue floral backing fabric and did some simple straight line quilting to echo the right and bottom edges of the colored strips. I bound the quilt using leftover binding from other projects. I love how much color there is. It's such a happy quilt! The quilt is on it's way to Nebraska. I hope Ella likes her Woven Rainbow and it helps her family wrap her in love during this difficult time. Thank you for visiting. I'm linking up to Needle and Thread Thursday, Finish it Up Friday, TGIFF and the Q2 FAL Finishes Linkup. 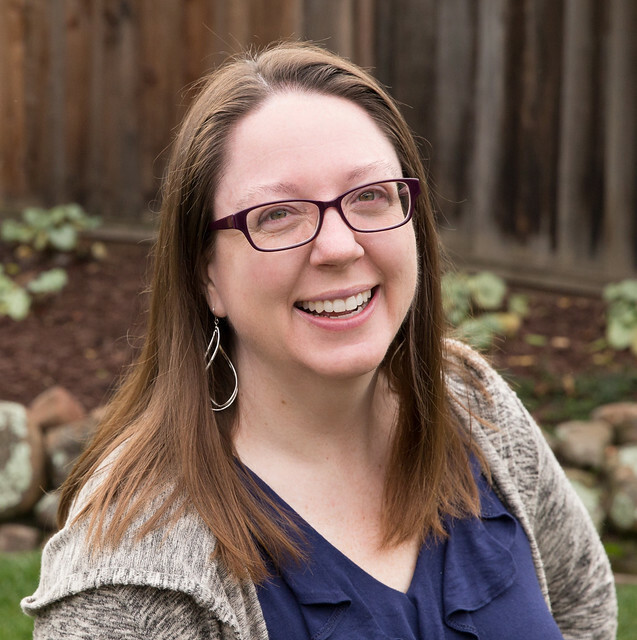 See all my Q2 goals here. Posted in Quilting. 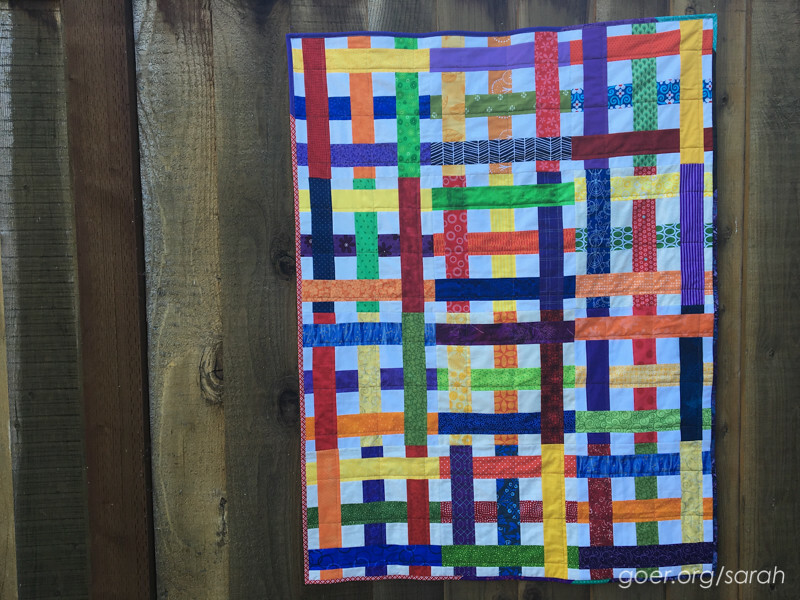 Tags: finished quilt, sew the rainbow, small quilt, Woven Rainbow on July 6, 2016 by sarah. I think I am going to cry...what a lovely gesture, Sarah, to give your happy rainbow quilt to Ella...It really is beautiful!! Thank you, Bo. I had my moments of tears while making it. How thoughtful Sarah. I hope it brings much comfort to Ella. Thank you, Cathy. So do I.
Oh my, what a sweet and generous quilt to make for Ella. 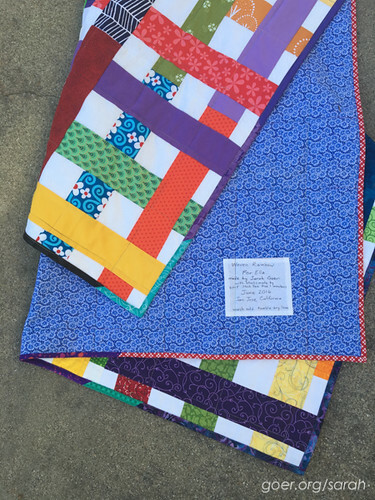 There can be so much sadness in this world, and I am buoyed by the love and response quilters seem to have to offer in return. Thank you, Yvonne. It's a little thing, but I like to think that the little things matter. Thank you, Katie! I haven't had a chance to email the group yet. Sarah, what a generous heart you have! Of course, the parents are hurting and missing their son, but the sister Ella is the one who doesn't understand death and loss. May your quilt give her comfort knowing that someone far away is thinking of her. I was going to write how much I love your woven blocks. And yes, I do. Then I read further and read how you have made them into a quilt for the sister of poor little Lane. What a lovely thing to do. We saw this terrible news on TV - we live half a world away in New Zealand, but bad news travels instantly these day. Certainly one of the drawbacks of the instant internet is hearing all the bad stuff. I think that makes it all the more important to do what we can to help. Thank you so much for visiting, and for commenting. What a wonderful thing you have done for Ella. It may feel like a small thing to you but really, it is so touching. My heart aches for the family. What a beautiful thing to do, and what a beautiful quilt. THIS IS AMAZING! Do you mind if I share this on the Stash Bee blog?? Thank you, Alison. I was meaning to email you the link. Glad you ran across it. Feel free to share. Oh Sarah: This is so touching. I'm glad you thought to send this quilt to Ella. I'm sure it will mean a lot to her and her family. Like everyone else who commented, I am so saddened by what this family is going through but touched by your kind gesture. 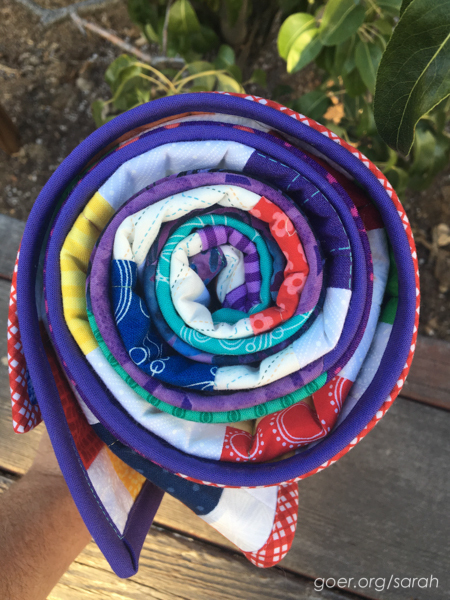 I believe quilting is healing for the people who make quilts as well as the ones who receive them. Thank you, Mary. I agree. 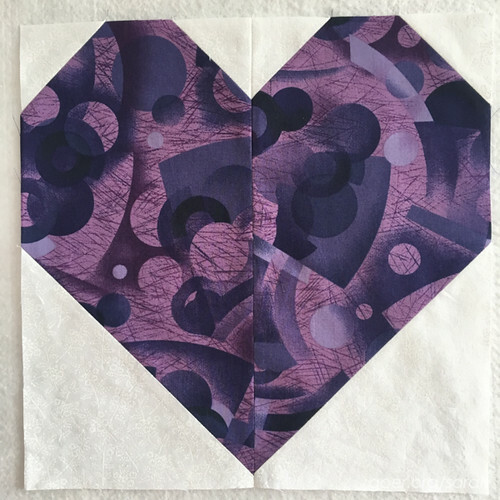 Quilting often helps me work through my own feelings. Beautiful quilt and such a lovely thought, I'm sure she will treasure it. Thank you, Shauna. That is my hope. This is a wonderful quilt, and so thoughtful of you to pull it out for the little one. It will be perfect for her. Congrats on your finish. Looking good! I love all those bright colors. Great work. Thank you for the visit and for helping to host the FAL. I find it very motivating! What a gracious and loving gesture, made physical by a beautiful quilt. Thanks for sharing your lovely Woven Rainbows finish. It is wonderful that you thought enough to share it with little Ella. I am sure she and her family will cherish it. Thanks for linking up with last week's TGIFF. You are so generous and I'm sure it's going to be so loved. Have you heard that it reached its destination? Thank you so much, Jess. I haven't heard anything. I just hope that Ella is enjoying it.